We were sent some books the other day that had just been published. As I opened the box and flipped them over the majority of the titles didn't really interest me...except one. The book with the great cover photo of 2 kids standing at an amusement park. 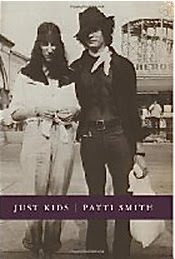 The title: "Just Kids" by Patti Smith. "Just Kids" is a beautifully written memoir from artist/musician/writer Patti Smith in which she reflects on her relationship with artist Robert Mapplethorpe. The book begins when the two were in their late teens and concludes with Mapplethorpe's passing. It is a simple, beautiful story about two people who connected with each other when they were young and naive, grew in separate directions, but still retained an inner, lasting bond that transcended way beyond sexuality and time. Smith's writing is a melody. It sings and glides and dances as you turn the pages of the book. I started thumbing though the book in the kitchen standing propped against the sink...an hour later I looked up after my initial "quick read" with a big..." oh wow". Regardless of what you may think of Patti Smith and Robert Mapplethorpe as artists, it's an undeniable fact they they defined a specific period of time in art and music history. They pushed boundaries and broke barriers. Their work forced people to open their eyes and their hearts. They also encouraged a whole generation of creative souls to express themselves more fully and completely. Anyone who is an artist, lived during that period of time or even have children who are currently artists, will relate to this book very easily. Others will simply enjoy a wonderful story about love, friendship and connection. Mind Body Spirit Odyssey was because of the unstated, underlying spiritual questions it generated for me. Why are we connected to some people so deeply in life? What are the reasons that we are brought together with a specific person? To help each other? To complete a specific tasks together in this lifetime? To learn from each other? To set an example for other people? Break new ground? I don't know the answers...no one does for sure....but it is definitely an interesting subject to ponder now and again. I really recommend this enchanting book.... Just Kids available at Amazon. Thanks for the review. I've been hearing a lot about this book and have heard a couple of interviews with Patti Smith. An interesting pair of souls for sure. I think its a worthy ponder.